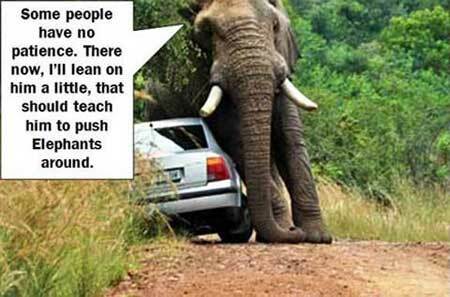 Elephants don’t tolerate lions crowding their space, so drivers should take a lesson. Another lesson is to never, did I say never? 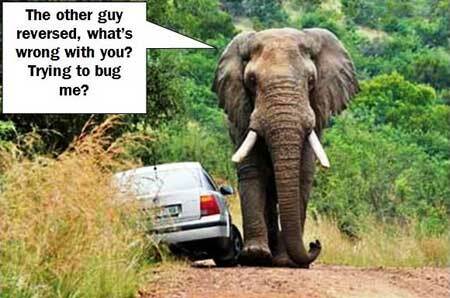 Sorry, well, never get in the way of a bull elephant in musth. If you’re not sure, stay away anyway; this is nature, respect it and keep a beady eye out for any danger signs! Don’t just think nothing is going to happen. “What a lovely day for a stroll… will be sixty eight next month. May have slowed down a little but I’m still trucking. 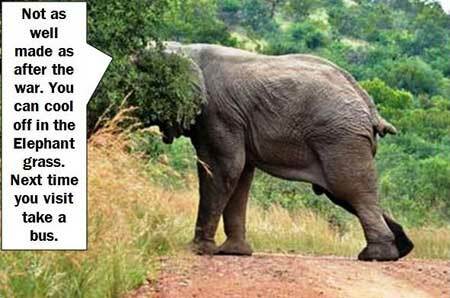 Can’t an elephant get some peace and a quiet walk in his own back yard anymore? 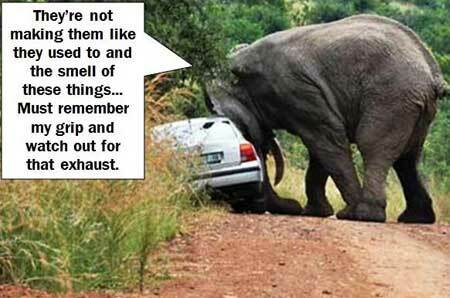 Always someone trying to push some poor elephant off the road, with their little tin matchbox. People in the old cars were much more polite than this new lot. It’s always the elephants’ fault, they are getting much more bad tempered than they used to be. No… people who drive these things think they own the road nowadays. 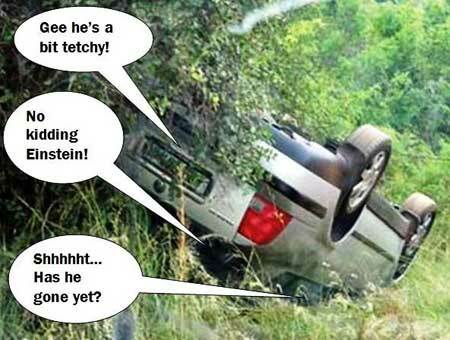 I remember when people used to show respect for the animals when driving in a park. In our own park they can show some common decency, especially to us elderly, well-behaved elephants trying to mind our own business year in and year out. Here comes the traffic again… so is it a good lot or a bad lot today, we’ll see? Hoot, rev, shout! Where’s the fire? Always in a hurry. Slow down to natures pace when you come around here. This is a sanctuary, not a bump-em-car rally, relax, go with the flow, live and let live and all that kind-o-stuff. 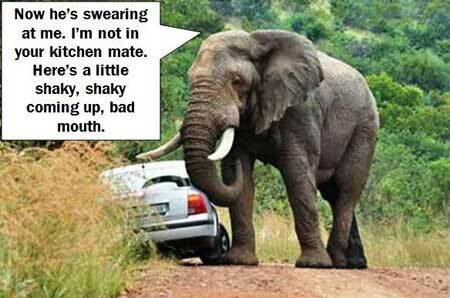 When going to a nature reserve, try and imagine you’re not in that tin can and be polite, elephants are well versed in manners. 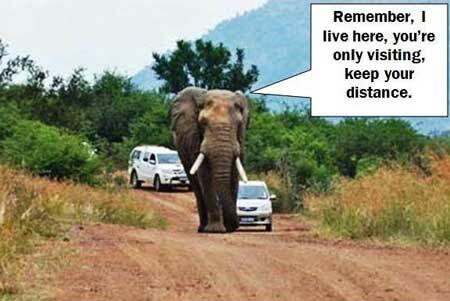 Remember no overtaking of elephants, no matter where you find them, they have a good sense of road possession. After all, they live there. 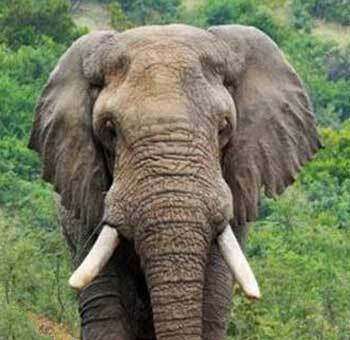 And any elephant that has a wet streak running down his temples behind the eye is in musth, like this one was and that’s a bad news elephant, if rubbed up the wrong way. Check you’re not near a river if an elephant decides to roll you.